Do you want to participate in the 2011 Google Online Marketing Challenge at JMU? If so read the online challenge information for students and check out the Google Online Marketing Challenge on Facebook to learn more about this exciting opportunity. To participate in the 2011 challenge under the direction of Dr. Theresa B. Clarke, complete the MKTG 490 Application no later than October 28, by 5:00 p.m. EST to apply for a spot in the Special Topics in Marketing course. The MKTG 490 course can count as a marketing elective for both B2B and B2C marketing concentrators. The class will meet on Fridays from 2:00p-5:00p during the spring semester. I hope to notify students via e-mail of their acceptance or rejection no later than November 1, 2010. 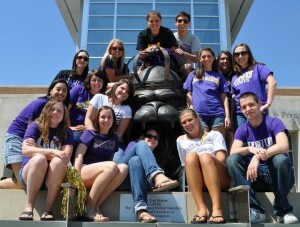 JMU Marketing Teams Excelled in the 2010 Google Online Marketing Challenge. In the 2010 Challenge, all five JMU teams performed in the “semi-finalist” category which means they performed better than at least 2,326 global participating teams. [Source: http://www.google.com/onlinechallenge/archive/2010/results.html]. In 2009, one of the JMU Marketing teams was named the Americas Winner. 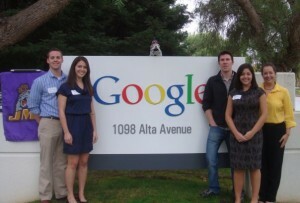 Check out the photo essay of JMU Marketing Students at the Googleplex. In 2008, one of the JMU Marketing teams was named a Finalist. 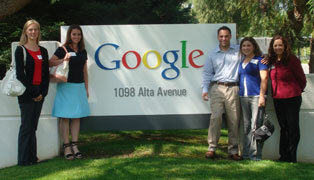 Read about the 2008 Marketing Challenge Finalists visiting the Googleplex. I look forward to working with 15 new students for the 2011 Challenge. Good luck to all MKTG 490 applicants! 9 Comments on "MKTG 490 and the 2011 Google Online Marketing Challenge at JMU"
After participating in the 2010 Google Challenge, I can honestly say that between Dr. Clark’s awesome lesson plans and the challenge itself, I gained an invaluable amount of experience! It’s fun, challenging, and rewarding! Participating in the Google Challenge was by far one of the best things I did during college. Dr. C really pushed us to our full potential and it definitely was a lot of hard work, but the overall experience was so rewarding because I learned more than I ever imagined I would. You gain great hands-on experience creating paid search campaigns when most marketing students aren’t even sure what paid search is! In addition, you become really close with your own team as well as the other teams. There were a few times we got to meet and work with different agencies, which was really helpful and inspiring. And working with Dr. C is awesome because she’s an amazing teacher who has so much to offer and she’s so supportive of her students and always there for anyone who is willing to try. Seriously – if you’re on the fence about taking this class, you want to enroll! You won’t be disappointed! Participating in Dr. Clarke’s Google Challenge Course was the best decision that I made at JMU. Out of all of the courses I took this was the one where I gained the highest amount of practical skills. Dr. Clarke’s lessons and teaching techniques are extremely helpful in learning how to use AdWords. She is very passionate about this course and wants her students to be finalists as much as they do. The knowledge you will gain by taking this course and actually participating in The Google Online Marketing Challenge (GOMCA) is invaluable. Before the challenge, I had no experience in Search Engine Marketing (SEM) and I now work in Search Engine Optimization (SEO) and Pay Per Click (PPC) Marketing. If you are interested in SEM then 100% recommend applying for this course! This is a great opportunity to learn a marketable skill and make connections with marketing professionals. Thank you to all of my former Challenge participants for your support of this opportunity.